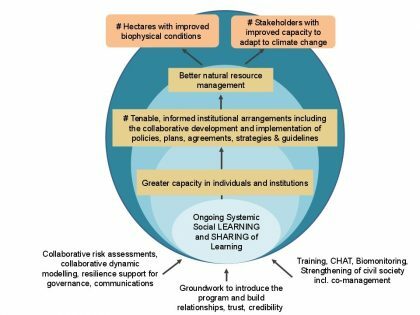 Resilience-building programmes in social-ecological systems require monitoring and evaluation (M&E) that respond to the complexity of the context, program and intended outcomes and enable ongoing learning. Figure 2: RESILIM-O theory of change showing the relationships between high level USAID indicators (the five topmost boxes) against which RESILIM-O is reported. AWARD added an emphasis on systemic, social learning, as foundational to the program, both a mechanism and an outcome. The concentric, shaded circles depict the non-linear way in which system-wide social learning is expected to spiral out from all program activities. Desired outcomes (e.g. collaborative development and implementation of policies and plans) are a result of social learning but also contribute to further social learning. 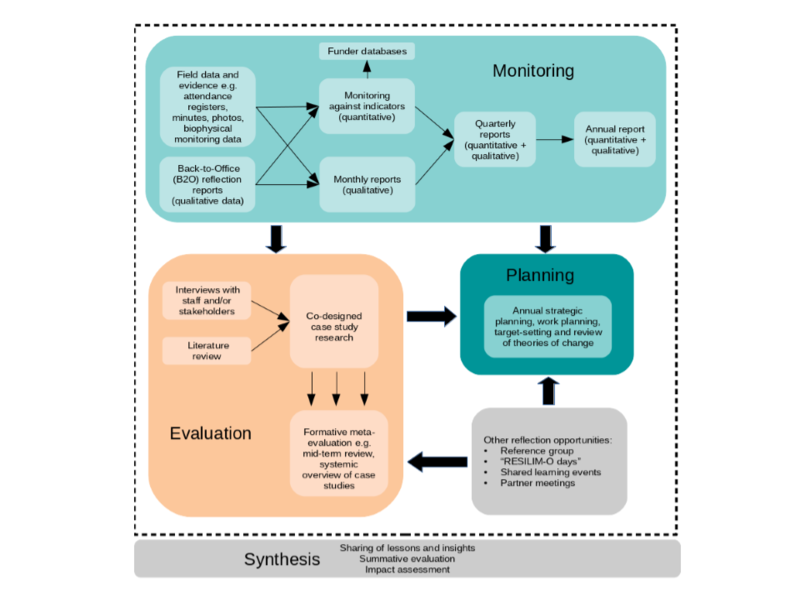 An iterative approach to the design of the MERL system itself, recognising (as in Patton’s concept of Developmental Evaluation) that a program or organisation will need different things from its M&E framework at different times in its life. A recent analysis (“Complexity-sensitive monitoring and evaluation in a coupled social-ecological system in Southern Africa: A hybrid methodology developed in AWARD’s RESILIM-O Program”) explores the ways in which our MERL system has enabled learning within RESILIM-O. This paper describes the formative phase of our MERL system, its features, implementation process, and outcomes related to learning. It analyses how the MERL system responds to complexity, and shares praxis-based insights useful for development programs in other complex social-ecological contexts. The results suggest that in addition to a responsive design, a successful MERL system requires a responsive disposition from implementers, funders and MERL team alike. The valuable “innovation space” created for MERL within RESILIM-O approach has potential to inform work elsewhere. Our MERL approach continues to attract interest from natural resource management professionals and researchers working in other parts of the country. 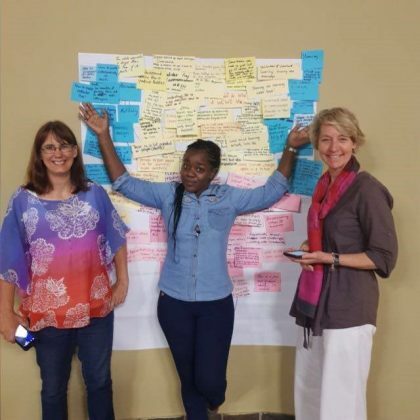 In 2018, AWARD was instrumental in initiating a Monitoring & Evaluation working group within SAPECS (South African Programme on Ecosystem Change and Society), a regional network of social-ecological systems researchers and practitioners. The RESILIM-O MERL team: (L to R) Karen Kotschy, Vhutshilo Mudau, Eureta Rosenberg.